I bought a large chicken which was slaughtered ‘live’ at the wet market. I hate going to the wet market to buy chicken because the place stinks. Moreover, the chicken is usually more expensive than those ‘dressed chicken’ I get from supermarkets. However, the stinking trip and the additional cost is worth it because the chicken does ‘leak’ so much water during roasting and it doesn’t smell. Some supermarket stored chicken smells of the supermarket, have you notice that? I chopped off the chicken neck and legs and trimmed off all the visible fats. Then, I gave it a karate chop with my palms to break the breast bone. Hahaha. 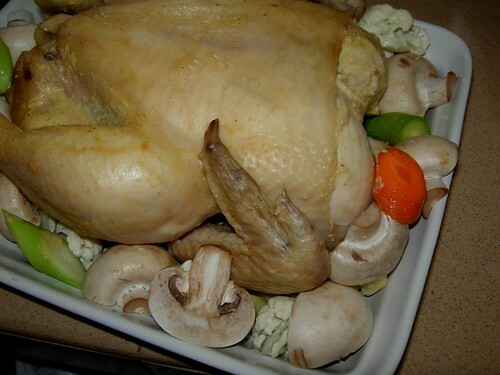 The purpose is to make the chicken flat-chested or it becomes too ‘high’ and may burnt during roasting as the breast part is too near the heating element. I only seasoned the chicken with some salt, dijon mustard and brandy. Initially, I put the chicken in the microwave and let it run through 10 minutes of microwave + convection oven. The chicken is almost semi-cooked. 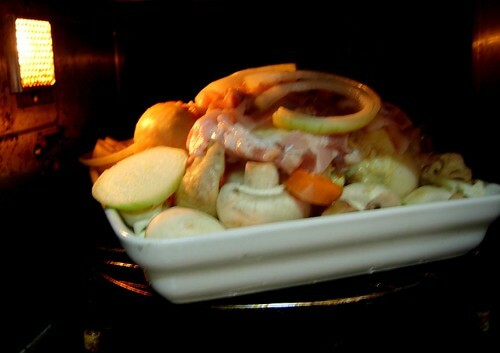 I took the dish out, and place lots of vegetables like leek, onion, carrot, garlic, cauliflower and button mushrooms. I also put some bacon to cover the vege to avoid them getting dry. My children have been asking for the puff pastry dish. 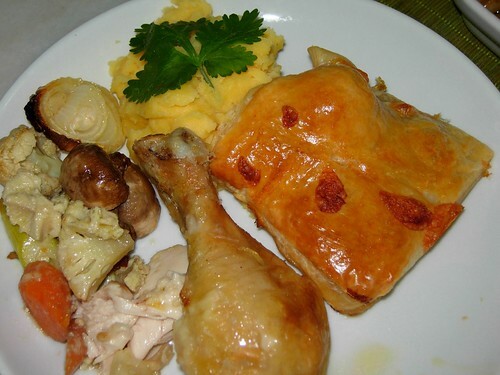 When the chicken is cooked and golden brown, I pour some mozarella cheese on it and place 6 pieces of frozen puff pastries. (The Kawan brand is great. It comes in small squares.) 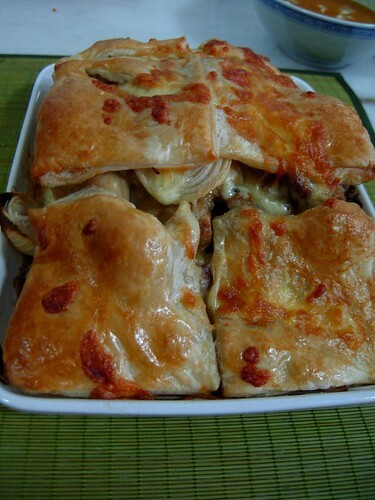 I glaze the pastry and sprinkle more mozarella cheese. I bake for another 20 minutes until the puff pastry, puffs up. What I get is a dish that is so yummy and almost complete. I served it with some butternut pumpkin soup and mashed potatoes. The chore of taking the baking dish in and out of the oven to add the layers is a bit tedious but it is worth it. The roasted chicken meal looks so delecious! I am drooling now! Your kids are really lucky!! That roast chicken looked so juicy! Now, if only I’m allowed to use Microwave oven…LOL. My DH is not so keen on having one at home. I totally agreed with you on the ‘smelly’ part of chicken at supermarkets. Even after many washes until the meat turned white streaks, the frozen-like-smell still lingered. The ones from Gama so far, has no such smell unlike those from Cold Storage. It’s frozen smell right? Is only when I have the chance to go to the fresh market I will buy fresh chicken,etc. To get there and be ready, took ages with a hyperactive toddler running around the home. By the time, I reached the market, most sellers already packed up…:-( I wonder if any of these sellers or market does home delivery service.